Lake Mead is a man made lake that lies on the Colorado River, about 24 mi (39 km) from the Las Vegas Strip, southeast of the city of Las Vegas, Nevada, in the states of Nevada and Arizona. It is the largest reservoir in the United States in terms of water capacity. Formed by the Hoover Dam on September 30, 1935, the reservoir serves water to the states of Arizona, California, and Nevada, as well as some of Mexico, providing sustenance to nearly 20 million people and large areas of farmland. The lake has not reached full capacity, however, since 1983 due to a combination of drought and increased water demand. As of August 2017[update], Lake Mead was at approximately 40% of full capacity with 10 million acre feet (12,000,000 ML) of held water. It has been smaller than Lake Powell (the second largest US reservoir when both are full) since 2013. 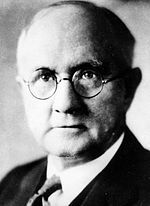 The lake was named after Elwood Mead, who was the commissioner of the U.S. Bureau of Reclamation from 1924 to 1936, during the planning and construction of the Boulder Canyon Project that created the dam and lake. Lake Mead was established as the Boulder Dam Recreation Area in 1936 administrated by the National Park Service. The name was changed to the Lake Mead National Recreation Area in 1964, and Lake Mohave and the Shivwits Plateau were added to its jurisdiction. Both lakes and the surrounding area offer year-round recreation options. The accumulated water from Hoover Dam forced the evacuation of several communities, most notably St. Thomas, Nevada, whose last resident left the town in 1938. The ruins of St. Thomas are sometimes visible when the water level in Lake Mead drops below normal. 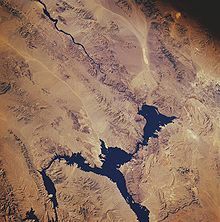 Lake Mead also covered the sites of the Colorado River landings of Callville and Rioville, Nevada, and the river crossing of Bonelli's Ferry, between Arizona and Nevada. Lake Mead from space in November 1985: North is facing downward to the right. The Colorado River can be seen leading southward away from the lake on the top left. The Hoover Dam is located where the river meets the lake. Nine main access points to the lake are available. On the west are three roads from the Las Vegas metropolitan area. Access from the northwest from Interstate 15 is through the Valley of Fire State Park and the Moapa River Indian Reservation to the Overton Arm of the lake. The lake is divided into several bodies. The large body closest to the Hoover Dam is Boulder Basin. The narrow channel, which was once known as Boulder Canyon and is now known as The Narrows, connects Boulder Basin to Virgin Basin to the east. The Virgin River and Muddy River empty into the Overton Arm, which is connected to the northern part of the Virgin Basin. The next basin to the east is Temple Basin, and following that is Gregg Basin, which is connected to the Temple Basin by the Virgin Canyon. When the lake levels are high enough, a section of the lake farther upstream from the Gregg Basin is flooded, which includes Grand Wash Bay, the Pearce Ferry Bay and launch ramp, and about 55 miles (89 km) of the Colorado River within the lower Grand Canyon, extending to the foot of 240 Mile Rapids (north of Peach Springs, Arizona). In addition, two small basins, the Muddy River Inlet and the Virgin River Basin, are flooded when the lake is high enough where these two rivers flow into the lake. As of February 2015, these basins remain dry. Jagged mountain ranges surround the lake, offering a scenic backdrop, especially at sunset. Two mountain ranges are within view of the Boulder Basin, the River Mountains, oriented northwest to southeast and the Muddy Mountains, oriented west to northeast. Bonelli Peak lies to the east of the Virgin Basin. Lake Mead receives the majority of its water from snow melt in the Colorado, Wyoming, and Utah Rocky Mountains. Inflows to the lake are largely moderated by the upstream Glen Canyon Dam, which is required to release 8.23 million acre feet (10,150,000 ML) of water each year to Lake Mead. Hoover Dam is required to release 9 million acre feet (11,000,000 ML) of water each year, with the difference made up by tributaries that join the Colorado below Glen Canyon or flow into Lake Mead. Outflow, which includes evaporation and delivery to Arizona, California, Nevada, and Mexico from Lake Mead are generally in the range of 9.5 to 9.7 million acre feet (11,700,000 to 12,000,000 ML), resulting in a net annual deficit of about 1.2 million acre feet (1,500,000 ML). Before the filling of Lake Powell (a reservoir of similar size to Lake Mead) behind Glen Canyon Dam, the Colorado River flowed largely unregulated into Lake Mead, making Mead more vulnerable to drought. From 1953 to 1956, the water level fell from 1,200 to 1,085 feet (366 to 331 m). During the filling of Lake Powell from 1963 to 1965, the water level fell from 1,205 to 1,090 feet (367 to 332 m). Multiple wet years from the 1970s to the 1990s filled both lakes to capacity, reaching a record high of 1,225 feet (373 m) in the summer of 1983. Lake Mead as seen from the Hoover Dam with the white band clearly showing the high water level on December 22, 2012. As a result of the decreasing water level, marinas and boat launch ramps have either had to be relocated to another area of the lake or have closed down permanently. The Las Vegas Bay Marina was relocated in 2002 and the Lake Mead Marina was relocated in 2008 to Hemenway Harbor. Overton Marina and Echo Bay Marina have been closed due to low levels in the northern part of the Overton Arm. Government Wash, Las Vegas Bay, and Pearce Ferry boat launch ramps have also been closed. Las Vegas Boat Harbor and Lake Mead Marina in Hemenway Harbor/Horsepower Cove remain open, along with Callville Bay Marina, Temple Bar Marina, Boulder Launch Area (former location of the Lake Mead Marina) and the South Cove launch ramp. Changing rainfall patterns, climate variability, high levels of evaporation, reduced snow melt runoff, and current water use patterns are putting pressure on water management resources at Lake Mead as the population relying on it for water, and the Hoover Dam for electricity, continues to increase. To lower the minimum lake level necessary to generate electricity from 1,050 feet (320 m) to 950 feet (290 m), Hoover Dam was retrofitted with wide-head turbines, designed to work efficiently with less flow in 2015 and 2016. If water levels continue to drop, Hoover Dam would cease generating electricity when the water level falls below 950 feet (290 m) and the lake would stabilize at a level of 895 feet (273 m) when the water reaches the lowest water outlet of the dam. In order to ensure that the city of Las Vegas will continue to be able to draw its drinking water from Lake Mead, nearly $1.5 billion was spent on building a new water intake tunnel in the middle of the lake at the elevation of 860 feet (260 m). The 3-mile (4.8 km) tunnel took seven years to build under the lake and was put into operation in late 2015. Lake Mead provides many types of recreation to locals and visitors. Boating is the most popular. Additional activities include fishing, swimming, sunbathing, and water skiing. Four marinas are located on Lake Mead: Las Vegas Boat Harbor and Lake Mead Marina (in Hemenway Harbor, NV) operated by the Gripentogs, and Callville Bay (in Callville Bay, NV) and Temple Bar (in Arizona), both operated by Forever Resorts. The area also has many coves with rocky cliffs and sandy beaches. Several small to medium-sized islands occur in the lake area depending on the water level. In addition, the Alan Bible Visitor Center hosts the Alan Bible Botanical Garden, a small garden of cactus and other plants native to the Mojave Desert. The Grand Wash is a recreational area located in the north side of the lake. At the bottom of the lake is a Boeing B-29 Superfortress that crashed in 1948 while testing a prototype missile guidance system known as "suntracker". ^ "Drought: Lake Mead is at an Historic Low". Ecowatch. April 28, 2015. Archived from the original on September 25, 2015. ^ USGS Circular 1381: A Synthesis of Aquatic Science for Management of Lakes Mead and Mohave. 2012. p. 11. Archived from the original on August 14, 2013. ^ Ferrari, Ronald L. (February 2008). "2001 Lake Mead Sedimentation Survey" (PDF). U.S. Bureau of Reclamation. Archived (PDF) from the original on September 21, 2012. Retrieved February 26, 2012. ^ "Lake Mead Water Database". lakemead.water-data.com. Retrieved August 29, 2017. ^ "Water Database". lakepowell.water-data.com. Archived from the original on August 30, 2017. Retrieved August 29, 2017. ^ Reclamation, Bureau of. "Historic Data | Water Operations | UC Region | Bureau of Reclamation". www.usbr.gov. Archived from the original on August 29, 2017. Retrieved August 29, 2017. ^ Federal Writers' Project (1941). Origin of Place Names: Nevada (PDF). W.P.A. p. 16. Archived (PDF) from the original on April 9, 2018. ^ a b Scott Gold (October 16, 2004). "It's a Historic Drought". Los Angeles Times. Archived from the original on August 14, 2011. Retrieved August 26, 2009. ^ Bryan Walsh (December 4, 2008). "Dying for a Drink". TIME. Time Inc. Archived from the original on November 4, 2012. Retrieved August 26, 2009. ^ "Utilization of Waters of the Colorado and Tijuana Rivers and of the Rio Grande: Treaty Between the United States of America and Mexico" (PDF). International Boundary and Water Commission. February 3, 1944. p. 22. Archived from the original (PDF) on March 23, 2014. ^ "Colorado River Update" (PDF). Cap-az.com. Archived (PDF) from the original on July 24, 2014. Retrieved December 13, 2014. ^ Paul Lutus. "* Lake Mead Water Levels". Arachnoid.com. Archived from the original on February 13, 2015. Retrieved December 13, 2014. ^ "Request Rejected". www.usbr.gov. Archived from the original on October 8, 2016. Retrieved May 5, 2018. ^ a b Team, Bureau of Reclamation, Lower Colorado Region Web. "Lower Colorado River Operations - Lower Colorado Region - Bureau of Reclamation". www.usbr.gov. Archived from the original on March 28, 2018. Retrieved May 5, 2018. ^ Arizona Game and Fish Department (2010). "Lake Levels/River Flow". Arizona Game and Fish Department. Archived from the original on July 16, 2010. Retrieved June 26, 2010. ^ U.S. Department of the Interior, Bureau of Reclamation. "Lake Mead at Hoover Dam, Elevation". Archived from the original on April 24, 2011. Retrieved February 17, 2011. ^ "Additional Water to be Released from Lake Powell to Lake Mead, Avoiding Shortages in Lower Basin in 2012". Home.doi.gov. Archived from the original on December 14, 2014. Retrieved December 13, 2014. ^ "Reclamation Forecasts Low Lake Powell Water Release for 2014". Wrrc.arizona.edu. Archived from the original on December 14, 2014. Retrieved December 13, 2014. ^ HENRY BREAN LAS VEGAS REVIEW-JOURNAL. "Lake Mead sinks to a record low". Las Vegas Review-Journal. Archived from the original on January 3, 2015. Retrieved December 13, 2014. ^ McGlade, Caitlin (June 24, 2015). "Lake Mead sinks to record low, risking water shortage". USA Today. Archived from the original on October 28, 2015. Retrieved October 25, 2015. ^ Heinsius, Ryan. "Lake Mead Drops to its Lowest-Ever Level". knau.org. Archived from the original on July 16, 2016. Retrieved May 5, 2018. ^ Boer, Katie (March 2, 2017). "Full snowpack cause small increase for Lake Mead water levels, but Nevada still in drought". lasvegasnow.com. Archived from the original on October 13, 2017. Retrieved May 5, 2018. ^ Online, Lakes. "Lake Mead Water Level". mead.uslakes.info. Archived from the original on March 6, 2018. Retrieved May 5, 2018. ^ "Latest forecast shifts Lake Mead from big gain to small loss". reviewjournal.com. June 16, 2017. Archived from the original on August 27, 2017. Retrieved May 5, 2018. ^ "Weather delaying move by marina". lasvegassun.com. October 1, 2002. Archived from the original on March 4, 2016. Retrieved May 5, 2018. ^ "Lake Mead Marina moved". reviewjournal.com. February 10, 2008. Archived from the original on March 4, 2016. Retrieved May 5, 2018. ^ Capehart, Mary Ann (Winter 2015). "Drought Diminishes Hydropower Capacity in Western U.S." Water Resources Research Center. Archived from the original on May 24, 2015. Retrieved August 26, 2017. ^ "Storage Capacity of Lake Mead - Lake Mead National Recreation Area (U.S. National Park Service)". www.nps.gov. Archived from the original on October 4, 2017. Retrieved May 5, 2018. ^ Jenkins, Matt (March 3, 2015). "The water czar who reshaped Colorado River politics" (41). High Country News. Archived from the original on May 16, 2015. Retrieved May 15, 2015. ^ "Last Straw: How The Fortunes Of Las Vegas Will Rise Or Fall With Lake Mead". popsci.com. Archived from the original on September 22, 2017. Retrieved May 5, 2018. ^ "Lake Mead: Exploring the B-29". National Oceanic and Atmospheric Administration. 2007. Archived from the original on December 15, 2007. Retrieved December 1, 2007. ^ "The Mystery of Lake Mead". lasvegasnow.com. Archived from the original on October 8, 2016. Retrieved September 17, 2016. Wikimedia Commons has media related to Lake Mead and Lake Mead National Recreation Area. "Arizona lakes water level report". azgfd.gov. National Park Service. "Lake Mead National Recreation Area". NPS.gov. "Natural Resources: "Historical and current water levels in Lake Mead". Arachnoid.com. US Department of the Interior. "Lake Mead elevation at Hoover Dam: monthly from Feb. 1935 to present". usbr.gov. US Department of the Interior. "Lower Colorado Region: Daily data of level and flow". usbr.gov.